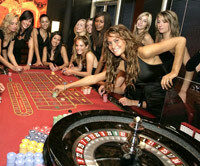 Here we give you the list of best roulette tips. While roulette seems to be completely the game of chance still there are some useful recommendations every roulette player should try to follow. Before playing for real money look through these tips. Never buy any roulette strategies and systems you are offered as in fact they don’t help to win. This is how people make money. Remember that all roulette strategies are thought to be a myth! One of the best roulette tips is to play European single zero roulette as it provides the lowest house edge and thus increases you winning odds. Look for the roulette tables which offer the “en prison” rule as this option allows reducing the house advantage. The “en prison” rule can be found only in European roulette. Always decide on your bankroll before the game. Never bet money you can’t afford to lose. Find the right moment to leave the table as the longer the game the more probabilities you have to end up losing. Play roulette for fun. Remember that this game is just a kind of entertainment but not the way you can get rich. Try to be calm and don’t get angry every time you lose. In roulette the house has advantage so the loss is inevitable. In addition, among the best roulette tips there is a good advice to structure your bankroll. In order to accomplish this task you are recommended to choose the even money bets, column and dozen bets as the safest. Though the even money bets provide the lowest payouts they allow to lower the house edge. Together with the “en prison” rule it is the best way to minimize the casino advantage. Of course, it does not mean that you must stop making other types of bets, such as straight-up, split and street bets which are regarded as the most risky. We just recommend you not to place these bets very often and even to choose them more rarely then the even money bets. They may occur to be successful only in the situation when the player is going to gamble endlessly, but no one is able to play under such condition. It is right time to end the game when you have beaten the wheel or lost a good part of your bankroll. Always bear in mind these roulette tips and play confidently.